The concept of this project was to create an open and inviting design, complimented with modern materials to create a dynamic atmosphere, while maintaining a corporate identity. Custom designed, stand up teller stations immediately greet and welcome customers. 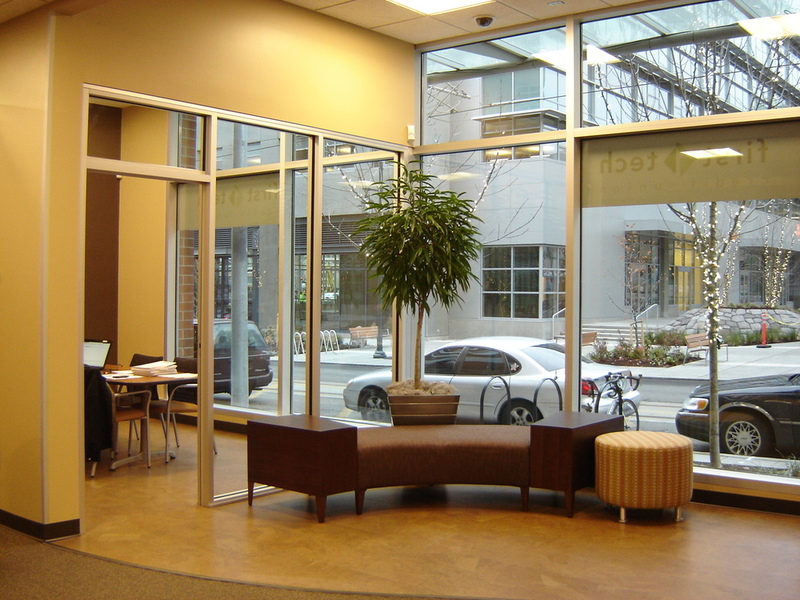 An adjacent waiting area offers a relaxing space, and is designed to provide customers with educational technology. This project has a similar design to the Microsoft Campus location. Custom designed teller stations greet and welcome customers. Laptops are used by staff, offering them flexibility to engage with customers. The portability concept permits meetings to be held within the various spaces created to provide different levels of privacy. The main area feels very open and relaxed, highlighted by comfortable furniture and LCD TV’s. Leaf patterned acrylic panels create a semi-private area. A multi-purpose conference room creates a private space.